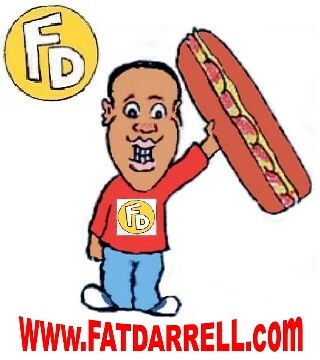 Final Four – #DoubleFML FatDarrellPalooza! Okay, I’m officially under the weather and over the weather at the same time. Hot then cold then hot then cold. It’s like one endless loop of my least favorite Katy Perry song. No wonder I’ve been sick for the past few days…although some of the symptoms could be due to this mutant pollen here in Atlanta. The worst part is that it looks so nice outside but nope. It’s still cold AF out there! It’s like those times when you’re heating something in the microwave and it’s making all these popping noises but once you bite into your food it’s still frozen in the center. It’s Spring already Mother Nature, please get your act together. Ha, I asked as though I have a clue about the NCAA tournament! I honestly don’t though…at least not the men’s side. How’s your team doing? Who ya got? Comment Below! Anyway, the Final Four referenced in the title wasn’t about the NCAA tournament, but instead, the NBA. More specifically, The Atlanta Hawks. Yes my friends, our season is almost over. Despite a tremendous second half, we won’t be making the playoffs this season so we’re down to the final 2 games. Wow, it feels like just yesterday that I typed up that “Taking Flight” post announcing my gig with the entertainment team (aka The Atlanta Hawks Flight Crew). I suppose I’ll save the season wrap up until it’s officially over, but I can already say that it’s been a fun and crazy adventure these past few months! Unfortunately, my family doesn’t live close, so they weren’t able to attend a game. I suppose that’s even more incentive to try out for the team again next year though so we can make that happen! Our last 2 games are on April 3rd and April 10th so if you’re in the area, come on down! As you can see, it’s a fun time! I’m halfway kidding I suppose, but if I’ve written you a check recently, you might not want to cash it for a few days! One of my teammates suggested that I sign up to drive for Uber since that’s what he does when he needs a few extra bucks but I’m an admittedly awful driver. Don’t get me wrong, I’ve never had an accident before, so at least I’m safe, but my sense of direction is trash! Even with GPS I’m good for several U-turns per trip! Anyway, speaking of gigs, I picked up yet another one recently! Yes, folks, for my next trick, I’ll be working as a stagehand for several Live Nation and House of Blues venues here in Atlanta! Ironically, I’m one of the least handy people in the world so this should be interesting! Anyway, my first show was for Colors R&B Only party at Buckhead Theater this past Saturday. Most of the work involved simple heavy lifting but I also helped build the set including the DJ stands and this enormous series of LED panels. I managed not to break anything or injure myself, so I’ll consider that a win! Although one of the main cables holding the expensive light display snapped at one point, sending the entire thing crashing to the ground! Work was halted for nearly an hour and we ended up scrambling to reassemble everything with only 45 minutes left before doors opened! I know what you’re thinking and yes, I was nearby but thankfully that wasn’t my fault! Oh yeah, speaking of staging gigs, my vest from working the Superbowl Halftime Show finally arrived the other day. Check it out! I doubt I’ll wear this much, but it is really nice! They even placed the logo on the inside as well, along with deep pockets. Wow, fancy fancy. Speaking of which, if you want to look fancy but don’t have the finances, sometimes you have to be creative. With the right attitude and a few minor adjustments, you can take yourself from broke to “broque” in no time! With that said, I’ve finally decided to try this recipe featuring the classic college student staple, ramen noodles! That’s right my friends, today we’re making Ramen Burgers! I keep seeing these weird burgers utilizing ramen noodles as the “buns” on social media, so I finally had to try one for myself! Heat about 1 tablespoon vegetable oil (or cooking spray) in a large skillet over medium-high heat. Invert each ramen bowl, gently tapping the bottom of the bowl until ramen loosens, careful to maintain bun shape. I saw another recipe that used mason jar tops to help shape the buns which was pretty smart. As a result, they were also able to forgo the refrigeration process by running cold water on the noodles before mixing them with eggs. Another variation I saw used the seasoning packet instead of salt and pepper. I suppose beef flavor would make the most sense but hey, whatever floats your boat! I went with the salt and pepper option though to avoid overpowering the flavor. For my ramen burger however, I went with a ground beef burger topped with egg, swiss cheese, lettuce and tomato. The verdict: Ha, not bad! Not bad at all! As you can see in the photos, it held together surprisingly well! I expected it to fall apart in my lap but I was actually able to pick it up and eat it like a normal burger! The consistency is interesting. It’s like a burger with spaghetti on it….because, it essentially is! It may take some trial and error to figure out how you’d like it seasoned and which condiments go best but mine was flavorful. With that said, I still doubt I’d make this very often. Although it’s a fun diversion, I can’t say this merger tastes better than ramen or burgers individually. If you’re looking for an interesting way to change things up or take your noodle game up a notch though, look for further fam! Since we’re talking about low budgets, how do you stay healthy when your funds are low? Most salads cost twice as much as their junk food counterparts so what’s one to do? The aforementioned ramen is full of sodium and not the greatest for you either. Fortunately, there are options such as eggs, Greek yogurt, tuna, whole wheat pasta, apples with peanut butter and more! Couponing, buying foods in bulk or even growing your own vegetables are another way to stay fit while staying within your budget. Although it may take a little extra research reading labels, inexpensive healthy options do exist! Do you have a fitness question, goal, accomplishment you’d like to share? What are some of your favorite inexpensive healthy foods? Comment Below! Before we go, let’s check out the “Foodie Holidays” for the next several days! Oh yeah, and my apologies to anyone confused by the sporadic release dates for our posts lately. The best way for you to keep up is by joining our mailing list by registering on the main menu. You can also “follow” our site by clicking that option below! In between posts, you can still get your meme fix by following our social media pages! Our Facebook page in particular is pretty hilarious if I do say so myself. Anyway, that about does it for this week. Please leave a comment before you go! Come on, don’t be shy. Be aggressive! B-E- Aggressive! Alright folks, thanks again for dropping by. Let’s make it a great week! Your Superbowl Vest is awesome!!! I can relate to the mutant pollen issue that you are having in Atlanta. Man, I am having a rough time here with it and Mother Nature’s changes in things: sneezing, itching, hot cold, and everything else. WOW! Stay well…Better days are coming!!! Thank you! I like the vest a lot too I’m just not sure how much I’ll actually wear it. I hope you feel better soon! This pollen count has been crazy lately! Better days are coming for you too though so hang in there! I really enjoyed this post!!! I always wonder how you find time to create such varied and interesting features with the busy schedule that you have. I see that the Hawks season in winding down. As demonstrated in your many pics and videos, I know that you have had an enjoyable and fun experience working with the Flight Team!!!. THANKS for sharing all of this with your readers!!!. Thanks Hope! I’m glad you enjoy the posts. the Hawks season was definitely a fun time. If you live near Atlanta, definitely come on down! Another interesting new Gig! Live Nation, huh? That wrench in your hand says it all…you are a “jack of all trades!” LOL So-o-o glad that i am reading your post tonight because now i know that tomorrow, April 2, is National Peanut Butter and Jelly Day!!! It’s on for me, probably starting at mid-night , because I love this stuff!!! Ah yes, with crunchy peanut butter of course! Ramen Burger Buns? What an interesting concoction!!! I can’t believe the buns held together so well for you I must admit, you did a “top notch” prep job with this one!!!. My taste buds are telling me to try this, but I have to think about this because I will probably end up with a mess!! !